So, I’ve been meaning to write about a number of up-and-coming country artists over the past few months, but just haven’t had the time. With that being said, I’m now going to make the time. Over the next few weeks (or months), I’ll be highlighting some of the folks out there that I feel are not getting the exposure they deserve. They may be brand new, they may have been around forever. I don’t know the reason why they aren’t racing up the country music charts, but my hope is to get the drum beat going on some fantastic artists that you may have missed. To start things off, I’ll be taking a look at an artist who I’ve heard nothing but good things about: Jacob Davis. As a bit of background (that comes from his website), at the age of fifteen, Davis picked up a guitar and started singing in his Shreveport, Louisiana bedroom. But it wasn’t until an open mic night during his junior year of college that he would ever perform on a stage. Sounds like the kind of story that leads to a successful country music career, right? What first got me interested in Davis, other than the positive feedback I received from his legion of fans, is his apparent love for 90’s country music. Let me tell you this, I was raised on country music from the 70’s, 80’s and 90’s, and have a particular love for the music of the 90’s (and not just country music). This is the time period where I was in Junior High, High School and College. Music was a major part of my life, and I’m glad that this decade proved inspirational to others. But enough about the 90’s. Let’s talk today. According to Music Row, just this week, Davis was signed by Black River Publishing to its songwriting roster where he joins Kelsea Ballerini, John King and more. So here’s what I really like about Davis: it’s all about his music. The first song I heard was “Down to Earth”. Good melody. Catchy lyrics. Simple. But then I read a little deeper into the meaning of the song and of course it’s a song about the birth of his daughter. Naturally, I had to listen. Having two daughters of my own, I know the feelings he’s expressing. Nailed it! Here’s a link to a live performance of the song. Another song I enjoyed was “Sooner than Later”. After hearing a couple of ballads, I loved the upbeat nature of the song. The lyrics also stood out. “She’s laying warm against my skin.” “She’s gonna love too hot…and burn too fast.” Who can’t relate to that. Here’s a link to a live performance from earlier this year. “Something to Remember You By” is another one that caught my attention. With lyrics such as “I look around anytime, anyplace, they’ll always be something to remember you by” how can you not relate to that. Here’s a link to the lyric video. But what really got me hooked is “Someone Else’s Girl”. We’ve all been there. In love with a girl that you can’t have because she’s with someone else. It’s a country music staple, right? But it certainly hits home. I remember back to college and a girl that I thought I was gonna marry…until she married someone else. Here’s a link to a live performance of the song earlier this year. What can I say. I love discovering new music and I especially love hearing from up-and-coming artists. Jacob Davis fits the bill. He’s an artist that obviously isn’t getting the recognition he deserves. I’ll definitely be keeping an eye out for him here on the West Coast. You should too! Make sure to check out his website and follow Jacob Davis on Twitter at @JacobDavisMusic and on Facebook. I hear the Jacob Davis Squad is pretty cool too. Probably should check them out as well at @JacobDavisSquad! Upcoming tour dates can be found here. Hey Jacob, how about a date at the Rodeo Club in San Jose or Duke’s in Portland??? So what did I miss? Have you seen Davis live? Is the show as good as the live clips on YouTube? Please share your thoughts in the comments section below. Just when you think a country music artist can’t get any better, they come back to town and leave you speechless. This is the only way that I can describe the latest performance from recording artist James Wesley’s this past week at The District, a fantastic new venue located in Gilroy, California, which featured Michael Beck of the Michael Beck Band as the opening act. If you don’t know Wesley already, then let me quickly educate you for a moment. With hits such as “Real”, “Didn’t I”, “Jackson Hole” and “Thank a Farmer”, Wesley has been getting airplay for quite some time now across the country. Special thanks go out to a number of California stations such as 95.3 KRTY, KAT Country 103 and 101.9 The Wolf who continue to keep Wesley on their playlists. Before I go too far, and jump into my review of this show, I can’t forget the rest of the band including Michael Blakemore, Jesse LaFave and Matt Morgeson because they’re pretty damn good at what they do too. But you get my point! Anyway, on to the show itself. First, a little backstory. This show was originally scheduled to take place at a venue that won’t be mentioned, but on two days notice, had to be moved to another location, the aforementioned The District. While this change of plans didn’t make things easy for fans wanting to catch Wesley live, an enthusiastic crowd still made the trek to show their support. Those who came were treated to a night of fun and GREAT music! Michael Beck took the stage first as the opening act. Beck is a local guy from the Bay Area (who by the way graduated from George Fox University just 10 minutes down the road from me here in Oregon). I know that California grown country artists don’t always get the attention they deserve, but this is an artist that Nashville needs to take notice of. Man. What a voice and stage presence that screams “Forget your drink…pay attention to me”. Most young artists can come off as unpolished or even unentertaining. Beck is nothing of the sort. He makes the audience want to get up out of their seats and sing along with every song. 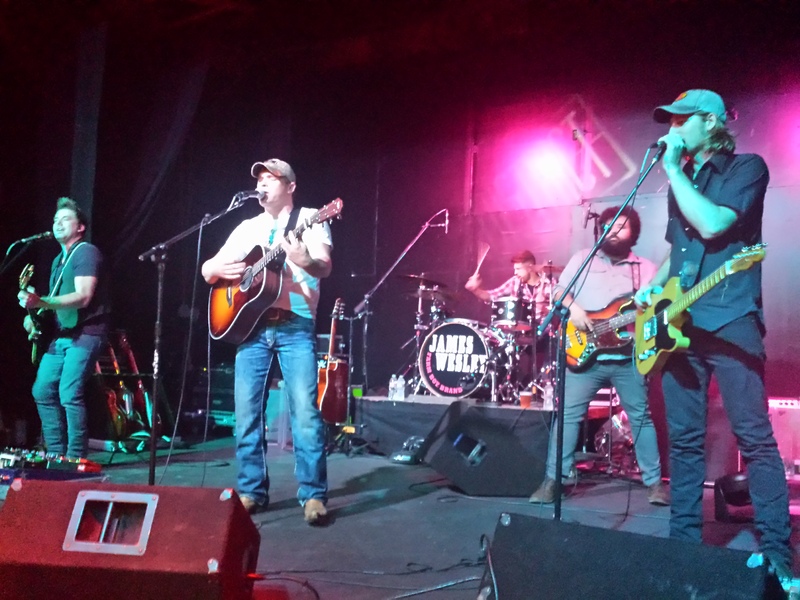 His setlist included songs from his CD “Countin’ on Tennessee” as well as an assortment of cover songs from the likes of Jon Pardi (Head Over Boots) and David Lee Murphy (Dust on the Bottle). From the EP, songs such as “Tennessee”, “Paradice” and “The Reason (I Love the Rain)” were a few of my favorites. But the one song that stood out to me, and I know is a personal favorite of Beck’s, is “Little Piece of Heaven”. To me, nothing is better than a song that is written from the heart, about someone you love. In this case, Beck’s 18 month old daughter. If you’re looking for a song that’s destined to be a hit, this is it. Check out Beck’s cover of “Head Over Boots” here. Want to learn more about this up-and-coming artist, visit his website, where you can also pick up the CD. Also check out the entire Michael Beck Band on Facebook for more information on news and upcoming shows. Around 9:30 p.m., it was time for the main event of the evening: James Wesley. So how do I describe James Wesley as an artist? Simple. He is a traditionalist, which is something that is rare in country music these days. Most importantly, he’s also VERY passionate about his music and his fans. He writes, or co-writes most of his own songs and both he, and the band, play their heart out each and every time they take the stage. Plus, Wesley is one of those guys on Twitter (@jameswesley1) who loves to engage with his fans. Make sure to give him a follow and check him out on Facebook. How would I describe a James Wesley show? How about high energy. Absolutely entertaining. Just like me, it’s a little bit country and a little bit rock and roll! I could go on and on with descriptors but I don’t want to bore you with my ranting. 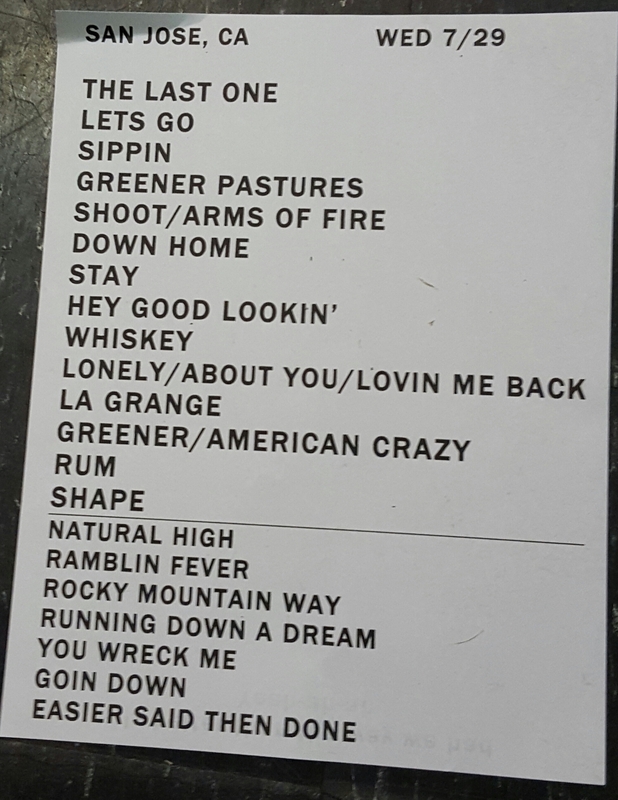 Besides the staple set list songs that I mentioned earlier (Jackson Hole, Real, Didn’t I) we were also treated once again with a selection of “new” songs that haven’t made it on the radio yet. Heck, maybe we can find them on an album in the near future? I’ve said this before, but just to reiterate, there are a few songs that I expect to be hits in the near future, including: “The You I Wanna Know”, “Running” (co-written with Marcum Stewart and Zac Wrixon) and “See You on the Radio” are just a few songs that continue to stick out for me as having the potential to be radio hits. The later, was the closing song on the set for this show and it certainly has the legs to make a solid run on country radio. Check out a live clip of “Real” here. Check out a live clip of “Running” here. But let’s not forget about the beauty of the cover song. One thing that Wesley and the band like to do is mix their own music with the sounds of Merle Haggard, Dwight Yoakam and George Jones. Some “I’m a Lonesome Fugitive”. A little “White Lightning”. Fantastic stuff. I mentioned earlier that if you see Wesley in concert one time you’ll be hooked. Well, now you can officially get “Hooked Up” with Wesley’s newest single by the same name. Back in April of last year, officials from Big Rock Sports, LLC announced that Calcutta®, a proprietary brand of Big Rock Sports, partnered with Wesley to produce the single and music video “Hooked Up”. The music video was shot last year during a concert that Wesley performed at the Big Rock Blue Marlin Tournament weigh station on the Morehead City, North Carolina waterfront. In case you’re wondering, he and the band will be back at the tournament on June 17. If you’re in the area, don’t miss it! Anyways, the song, which tells the story of anglers chasing blue marlin—through the eyes of the marlin—at the Big Rock, was released through iTunes, CalcuttaFishing.com, and Thebigrock.com so you will definitely want to check this out. Wesley and the band played it live for the first time at this show last year and it was great to hear it again on the set list this year. I am going out on a ledge and say that this will be a radio hit in the very near future. Do you hear that country radio? It’s time to get this song on the air! Check out a live clip of “Hooked Up” here. So as always, I’ve talked your ear off. But let me say this once again: there are only a few artists that I give a five star recommendation to. James Wesley is one of them. If there is one artist that you see in concert in the next year, make sure that it’s Wesley. Have you seen Wesley and the band in concert? What did you think? Please leave your comments and thoughts in the comments below! I would love to hear about your similar experiences! James Wesley is back, and he’s back in a big way! The last time many of you heard from Wesley, he was hitting the airwaves with “Thank a Farmer”, a heartfelt ballad which tells the story of how much hard work it takes to be a farmer in Middle America. And it doesn’t come much more Middle America than Wesley’s music. First, a little background. Wesley grew up in Mound Valley, a community of only 200 people in Southeastern Kansas. He first discovered country music via his grandmother’s record collection, which included heaping helpings of classic crooners such as Marty Robbins, George Jones and Ray Price. His mother was the first to notice Wesley’s own talent for singing when she overheard him belting out his favorite songs behind his bedroom door. By his late teens he was singing in local nightclubs and beginning to think about making music his life. I can certainly say that i’m glad he made this decision. Wesley signed with Broken Bow Records back in 2009 and quickly exploded onto the country music scene with his debut breakout single “Jackson Hole.” To date he has had two Top 25 singles, including one of my personal favorites “Real”, making his voice a staple on country radio. If you’ve ever seen Wesley in concert, then you know that he sings directly to real people about real things that profoundly affect real lives. From his small-town upbringing to his blue-collar work ethic, Wesley has a deep understanding of what country listeners want to hear. Now, on to the song. “Hooked Up” was co-written by Harry Smith and Todd Morris, and tells the story of a blue marlin that is being pursued by fisherman at the Big Rock Blue Marlin Tournament. 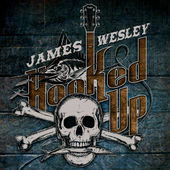 Announced backed in April, Wesley formed a partnership with Calcutta to shoot the “Hooked Up” music video and promote the song to the sport fishing communities. The accompanying music video for “Hooked Up” takes fans along with him for the journey of a lifetime. The video was shot during a concert, performed by Wesley, which took place at the new Big Rock Blue Marlin Tournament weigh station on the Morehead City, North Carolina waterfront. Additional footage was shot during the tournament between June 6–13. OK, before I tell you why I love this song, go ahead and check out the video for yourself. Now you’ve seen the video and heard the song for yourself. Admit it, there’s so much to love about “Hooked Up”. It’s so easy to get hooked by the chorus. It’s upbeat. It’s toe tapping. I’ve listened to the song a good 70-75 times now, and each time I get to the chorus, I find myself belting out the lyrics at the top of my lungs. Sadly, the kids keep telling me to leave the singing to the artist. They’re probably right! But isn’t that what country music is all about? Isn’t it supposed to make you feel passion? Shouldn’t it make you want to sing along at the top of your lungs? I’ve said it before, and I’ll say it again: country radio NEEDS more James Wesley. Is “Hooked Up” the song that takes him back to the top of the charts? I certainly hope so. I think it certainly has a chance! My step father, who passed away this past March, was a fisherman his entire life. He used to tell all those fish stories that you always hear about. Catching the “big one” and “the one that got away”. He told them all. He participated in tournaments around the country. He spent years in Alaska. He even owned his own charter in Bodega Bay/Tomales Bay, California. Bald Eagle Fishing. I’ll never forget it. Before I forget, a portion of the proceeds from downloads will go to the Big Rock Blue Marlin Tournament Charities and the ASA’s Keep America Fishing Foundation, so make sure you download “Hooked Up” today from iTunes or from CalcuttaFishing.com and TheBigRock.com. Also, can’t forget the guys who don’t always get the credit they deserve. Michael Blakemore, Jesse LaFave, Matt Morgeson and Drew Scheuer. You guys all rock! Don’t wait. Go get “Hooked Up” now. You won’t regret it! For more information about Wesley, and to take a listen to the rest of his catalog, visit JamesWesleyMusic.com. Forget staying a little longer. I would have stayed all night for more music from Lauren Alaina (Interscope Records) and the Brothers Osborne (Universal Music Nashville). When you come to the Rodeo Club in San Jose, you know that you’re in for a treat at each and every show. On this night, the audience did not leave disappointed. After a quick, pre-show set from Chris Giles, Director of Business Operations for the San Francisco 49ers, and country musician (who knew??? ), it was time for Lauren Alaina to take the stage. You may know Alaina best from her appearance on the 10th season of American Idol where she finished as the runner-up. American Idol was certainly an experience which displayed her enthusiasm and incredibly powerful voice that has been compared to the leading ladies of country music including Carrie Underwood and Martina McBride. But well before American Idol, Alaina’s first public performances came with a kids’ choir as well as an annual vacation location that offered karaoke (who doesn’t love karaoke!). According to her website, word soon spread about her talent and she began receiving invitations to perform at different venues. Beginning in elementary school, she routinely landed lead roles in school plays. Obviously, music came to Alaina at a very early age. Her debut studio album, Wildflower was released in October of 2011. The album, which included one of my personal favorites “Georgia Peaches”, as well as “Like My Mother Does” and the radio hit “18 Inches”, debuted at number five on the Billboard 200 chart. She’s currently working on some new music for her upcoming sophomore album, which she showcased to a full house at the Rodeo Club. 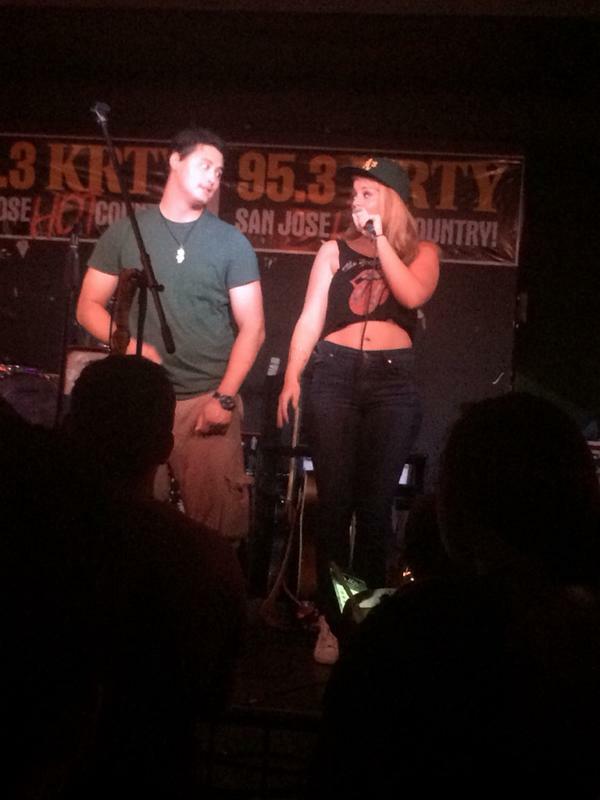 I think one of the best moments of the night would be during her performance of “Next Boyfriend” where lucky attendee “Kevin” (and his A’s hat which was quickly confiscated by Lauren) was pulled up on stage as she performed. Luckily this time, “Kevin” wasn’t married, or her cousin, which apparently happened to her at an earlier event. Oops! We were also treated to “My Kind of People”, which was my personal favorite of her new music, as well as a fantastic rendition of Little Big Town’s “Girl Crush”. Good stuff all around! I’ve got to tell you something. After last night’s performance, I know why Alaina is compared with the likes of Carrie Underwood and Martina McBride. Her vocals are incredible, which is amazing considering she’s coming off vocal chord surgery just last year. I can’t imagine the recovery process and getting back into the studio and out on the road. MAJOR kudos Lauren! If you have not seen her perform live, make sure to check her out! You won’t regret it! Make sure that you are also following Alaina on Twitter at @Lauren_Alaina and on Facebook. 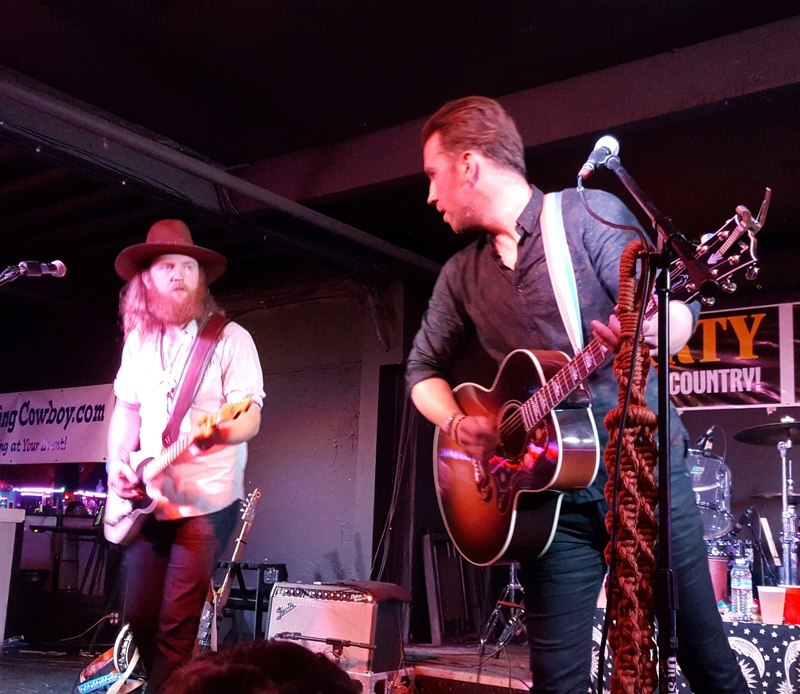 Around 10 p.m., it was finally time for the main event of the evening: The Brothers Osborne. This is a band I have been waiting to see for months. I had the opportunity to see them twice before, but both times, my plans were changed at the last minutes. I’ve have been kicking myself for not seeing them, but this time around, nothing was going to stop me from seeing them. As background, the Brothers Osborne, (John and T.J. Osborne) once performed in a cover band called Deuce and a Quarter, where they played cover songs from Lynyrd Skynyrd, Dwight Yoakam, Merle Haggard and Bob Seger. 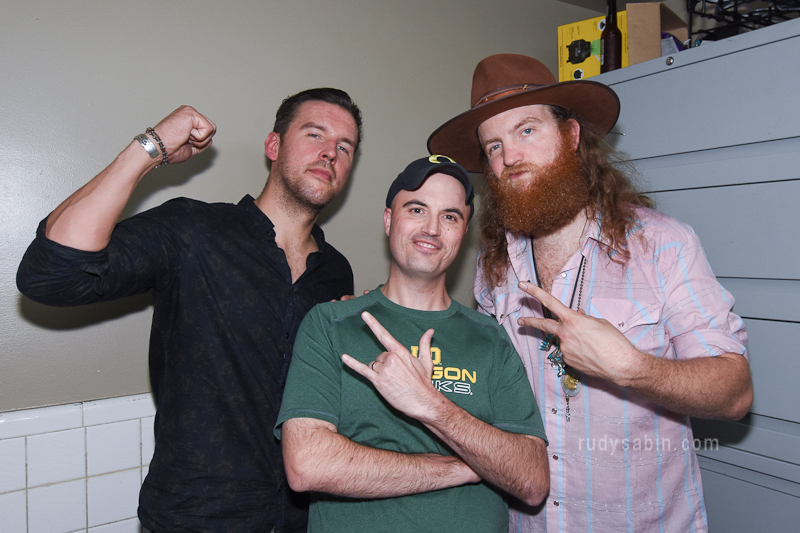 While in this band, they performed at small, local venues, but it was this experience that the Brothers Osborne got the taste for performing live. In the mid-2000’s they moved to Nashville to pursue their dreams. The duo released their debut single “Let’s Go There”, which reached Top 40 on Country Airplay at the end of 2013.Their second single, “Rum”, a personal favorite of mine, debuted in early 2014. The single also reached Top 40 on Country Airplay, and is included on their five-song, self-titled EP. Their third single, “Stay a Little Longer”, originally appeared on the EP, but it has since been re-recorded as a single release and is currently their third consecutive top 40 country hit. Let me tell you this: the Brothers Osborne are talented. VERY talented. The audience was treated to a mix of traditional country, modern country and southern rock. You name it, they played it. What was great was that we got a sample of not only their radio hits, but also some new music that the band is currently recording. I especially loved “Greener Pastures”. I won’t dive into what the song is about but you can let your mind wander and come up with an idea, based on the title. I think Willie Nelson would be proud! The audience, naturally, was all over “Stay a Little Longer” and “Rum”, but enjoyed hearing a few cover tunes, including “Hey Good Lookin'” and “La Grange”. How can you not love it when a band can pull off both Hank Williams and ZZ Top flawlessly! Those performances were two of the highlights of the evening for me. BTW, Lauren Alaina came out in the audience during the Brothers Osborne set and sang along to every single song. Heck, she was standing right next to me and it was obvious that she was a fan, just like the rest of us. You’ve got to love seeing another artist in a moment of fandom! I’ll admit, though, that I felt pretty bad screaming into her ear as I sang along. Hope she didn’t mind!!! Anyways…I would be remiss in not mentioning two things. First, the guitar playing by John Osborne is something that you need to see live. All I can say is wow! Words won’t do justice. Second, the vocals from T.J. Osborne are up there with the best. He was certainly “on” on this night, whether he was rocking out or taking it down a little with a ballad. The range was incredible. 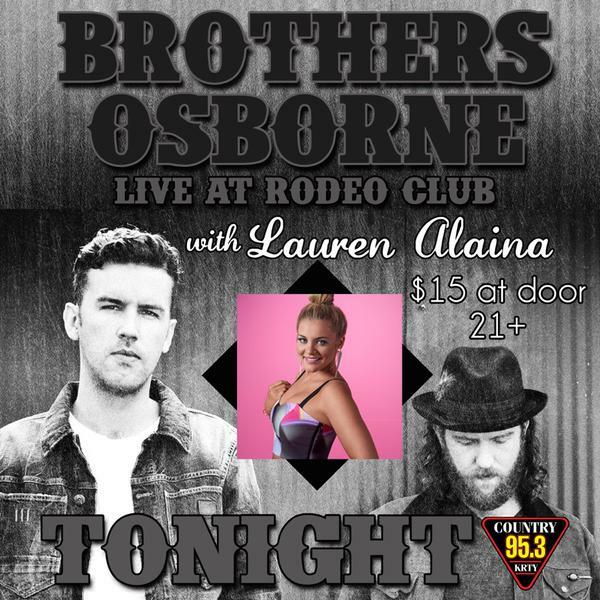 If you haven’t seen the Brothers Osborne (and their full band) before, what are you waiting for??? 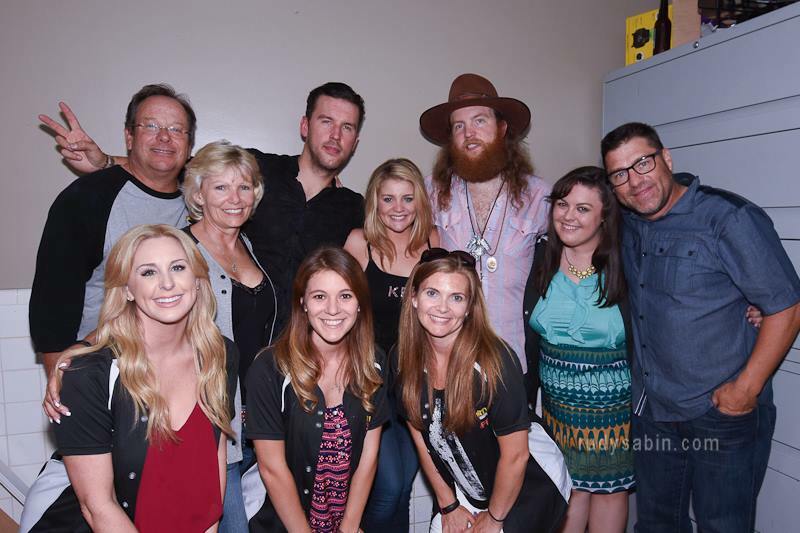 Make sure that you are also following the Brothers Osborne on Twitter at @brothersosborne and on Facebook. I’m very excited that I get to see them again on Friday, July 31 at Shoreline Amphitheatre opening for Darius Rucker. Heck, A Thousand Horses and Brett Eldredge will be there too. I better get myself prepared for my head to explode from an evening of fantastic country music! Overall, another great night of country music with KRTY. As always, thank you to Nate Deaton, Julie Stevens, Tina Ferguson, Randy Jones, Danika Gurley, Jenna Johnson etc…for once again bringing the best in up-and-coming talent to the South Bay. Also have to give thanks to one of the best photographers out there…Rudy Sabin (see his photos above and below). The guy is incredible. Be sure to check out his website for some samples of his work and follow him on Twitter at @rudyphoto. What did you think of the show? Have you seen either of the performers before? Please feel free to leave your thoughts on the show, or the artists themselves, in the comments below.